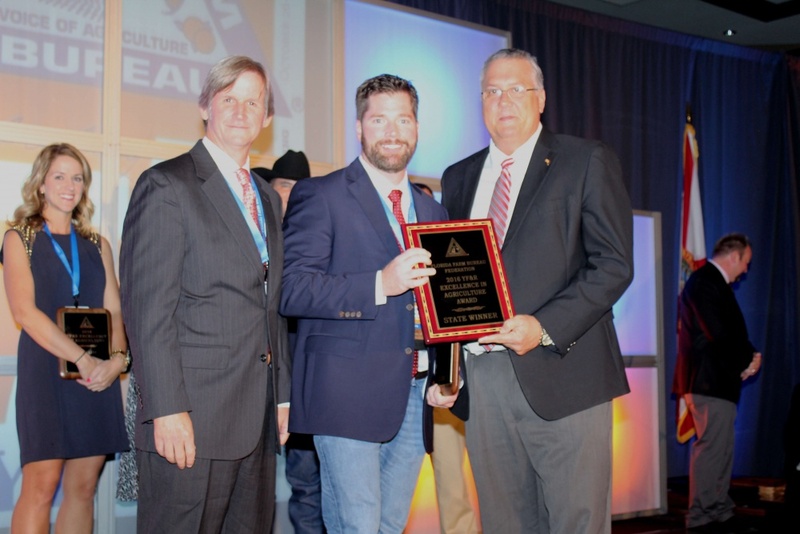 Gainesville, Fla. – Dean Cheshire of Alachua County was named the winner of Florida Farm Bureau’s Excellence in Agriculture competition. This competition is open to farmers and ranchers between the ages of 18 and 35 who do not derive the majority of their income from an owned farm operation. The winner was announced during the President’s Awards Banquet at Florida Farm Bureau’s 75th Annual Meeting in Orlando on Oct. 26. Finalists in the competition also included Courtney Davis of Okeechobee County, Buck and Norabeth Carpenter of Madison County and Kevin Wright of Suwannee County. Contestants were judged on the basis of their involvement in agriculture, leadership ability, participation in Farm Bureau and community service. In addition to receiving an ATV 4-wheeler, courtesy of Southern Farm Bureau Life, and a $500 cash award, Cheshire received an expense-paid trip to the American Farm Bureau Federation Annual Meeting in Phoenix, Jan. 6-11, where he will compete in the national competition. Cheshire is an Alachua County native and business entrepreneur who owns and operates Cheshire Companies in Gainesville. Cheshire was the Florida Farm Bureau Discussion Meet champion in 2015 and advanced to the American Farm Bureau Discussion Meet in January where he placed in the Final Four.